We offer volume pricing, email sales@cobbes.com for a quote. Twin Gear juicers provide the most nutrient-rich juice available from a domestic juice extractor. They are the tool of choice for the serious juicing enthusiast and for those who are using juicing to combat poor health or maximum nutrition. 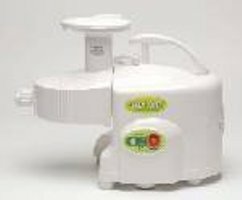 Manufactured by the original inventor of the GreenPower Gold (1992), the GreenLife & Greenstar (1998) This juicer is the leader and newest of all imported Twin Gear machines, so you can buy with confidence. The Green Power 1304 is the latest edition from the same family as the Kempo, Hippocrates and Samson Ultra and the machines have the same juicing parts. There are slight differences in the cosmetics and accessory levels between the versions available but the performance is the same for most functions. The attraction of this model comes from the excellent price and value. Given that its performance is more or less the same as the other compact Twin Gear machines; we think this one offers excellent value. It is the latest version of this machine. It also offers an optional separate set of gears and parts for wheatgrass that perform better than the normal juicing gears when making this potent juice. It has separate screens for vegetables, fruit and crushing/pureeing functions and a separate pulp pressure adjuster for soft fruits. It can be used to make nut butter and frozen fruit sorbets. Also included in the box are pasta and noodle attachments and a DVD. The DVD gives a quick visual reference before you start juicing with the Green Power 1304 for the first time. The pulp control nozzle is easily accessible and the low speed twin gears share the familiar "Bio-Magnetic" technology that is claimed to preserve the juice for longer periods. Magnets are fitted in the base of the jug too and a stainless steel pulp catcher is also included. Like all Twin Gear machines, this model is excellent at making green juices. Herbs, wheatgrass, barleygrass, pine needles and all other healthy greens are thoroughly pulverized by the closely fitting gears that grind everything to a fine pulp. Currently available in white, the GreenPower 1304 offers excellent value and it is lighter and more compact than some other Twin Gear machines. The optional separate wheatgrass gears will increase the appeal even further for some juicing enthusiasts. EASY TO CLEAN - Juice Extractor is easy to clean and to carry. MAGNETIC AND BIO-CERAMIC TECHNOLOGY - Juice Extractor uses powerful magnets and bio-ceramic materials in its Juice Bowl and Twin Gears, thereby producing fresh juice which can be stored for longer periods. SEPARATING PESTICIDES - Juice Extractor filters out harmful pesticides extracting the natural juice in fruits and vegetables. TWIN GEARS DO NOT TOUCH EACH OTHER - The twin metal gears do not touch each other which prevents any possibility of metal scraps caused by friction to get into the juice or pulp. AUTOMATIC PULP EJECTION - Two adjustable pulp inlet caps permit high levels of juice extraction from a wide variety of fruits and vegetables. MULTI-PURPOSE FUNCTIONS - Vegetables and various grains can be easily ground. Using multi-purpose parts (optional), it can make a variety of pastas and noodles, as well as clean juice. LOW NOISE, HIGH QUALITY JUICING - The low speed rotation (160 rpm) of the unique, powerful, twin gear impeller and pressing system generates virtually no heat that would cause denature to the juice. Fruits and vegetables are thoroughly crushed, rather than cutting and shredding them into small pieces. AUTOMATIC OVERHEATING THERMOSTAT - The automatic motor thermostat prevents the motor from overheating. Juices wheatgrass, barley grass and herbs. Magnetized and bio-ceramic juicing jug keeps juice fresh with no loss of nutrition or oxidation for 72 hours. The quietest machine on the market (60DB). Collection jug prevents high build-up of froth. Makes nutritious ice cream, nut butters, jams and baby food. Grinds coffee, grains and nuts. 10 Limited year parts and labor warranty.